If you’ve worked your way right through the last three chapters, you are probably feeling somewhat overwhelmed by all the factors to take into consideration when selecting media. It is a complex issue, but if you have read all the previous sections, you are already in a good position to make well informed decisions. Let me explain. Many years ago, when I first developed the ACTIONS model, I was approached by a representative of a large international computer company who offered to automate the ACTIONS model (this was in the days when data was entered to computers using punched cards). We sat down over a cup of coffee, and he outlined his plan. Here’s how the conversation went. Pierre. Tony. I’m really excited about your model. We could take it and apply it in every school and university in the world. Tony. Really? Now how would you do that? Pierre. Well, you have a set of questions that teachers have to ask for each of the criteria. There is probably a limited set of answers to these questions. You could either work out what those answers are, or collect answers from a representative sample of teachers. You could then give scores to each technology depending on the answers they give. So when a teacher has to make a choice of technology, they would sit down, answer the questions, then depending on their answers, the computer would calculate the best choice of technology. Voilà! Tony. I don’t think that’s going to work, Pierre. Tony. I’m not sure, but I have a gut feeling about this. Pierre. A gut feeling? My English is not so good. What do you mean by a gut feeling? Tony. Pierre, your English is excellent. My response is not entirely logical, so let me try and think it through now, both for you and me, why I don’t think this will work. First, I’m not sure there is a limited number of possible answers to each question, but even if there is, it’s not going to work. Tony. Because I’m not sure how they would score their response to each question and in any case there’s going to be interaction between the the answers to the questions. It’s not the addition of each answer that will determine what technology they might use, but how those answers combine. From a computing point of view, there could be very many different combinations of answers, and I’m not sure what the significant combinations are likely to be with regard to choosing each technology. Pierre. But we have very big and fast computers, and we can simplify the process through algorithms. Tony. Yes, but you have to take into account the context in which teachers will make media selections. They are going to be making decisions about media all the time, in many different contexts. It’s just not practical to sit down at a computer, answer all the questions, then wait for the computer’s recommendation. Pierre. But won’t you give this a try? We can work through all these problems. Tony. Pierre, I really appreciate your suggestion, but my gut tells me this won’t work, and I really don’t want to waste your time or mine on this. Pierre. Well, what are you going to tell teachers then? How will they make their decisions? Tony. I will tell them to use their gut instinct, Pierre – but influenced by the ACTIONS model. This really is a true story, although the actual words spoken may have been different. What we have in this scenario is a conflict between deductive reasoning (Pierre) and inductive reasoning (Tony). With deductive reasoning, you would do what Pierre suggests: start without any prior conceptions about which technology to use, answer each of the questions I posed at the end of each part of the SECTIONS model, then write down all the possible technologies that would fit the answers to each question, see what technology would best match each of the questions/criteria, and ‘score’ each technology on a recommended scale for each criterion. You would then try to find a way to add all those answers together, perhaps by using a very large matrix, and then end up with a decision about what technology to use. As evidence accumulates, the degree to which the collection of true evidence statements comes to support a hypothesis, as measured by the logic, should tend to indicate that false hypotheses are probably false and that true hypotheses are probably true. In terms of selecting media, you probably start with a number of possible technologies in mind at the beginning of the process (hypotheses – or your gut feeling). My suggested process is start with your gut feeling about which technologies you’re thinking of using, but keeping an open mind, then move through all the questions suggested in each of the SECTIONS criteria. You then start building more evidence to support or reject the use of a particular medium or technology. By the end of the process you have a ‘probabilistic’ view of what combinations of media will work best for you and why. This is not an exercise you would have to do every time. Once you have done it just a few times, the choice of medium or technology in each ‘new’ situation will be quicker and easier, because the brain stores all the previous information and you have a framework (the SECTIONS model) for organising new information as it arrives and integrating it with your previous knowledge. Now you’ve read this chapter you already have a set of questions for consideration (I have listed them all together in Appendix 2 for easy reference). You are now in the same position as the king who asked the alchemist how to make gold. ‘It’s easy’, said the alchemist, ‘so long as you don’t think about elephants.’ Well, having read the three chapters on media in full, you now have the elephants in your head. It will be difficult to ignore them. The brain is in fact a wonderful instrument for making intuitive or inductive decisions of this kind. The trick though is to have all this information somewhere in your head, so you can pull it all out when you need it. The brain does this very quickly. Your decisions won’t always be perfect, but they will be a lot better than if you hadn’t already thought about all these issues, and in life, rough but ready usually beats perfect but late. Media selection does not happen in a vacuum. There are many other factors to consider when designing teaching. 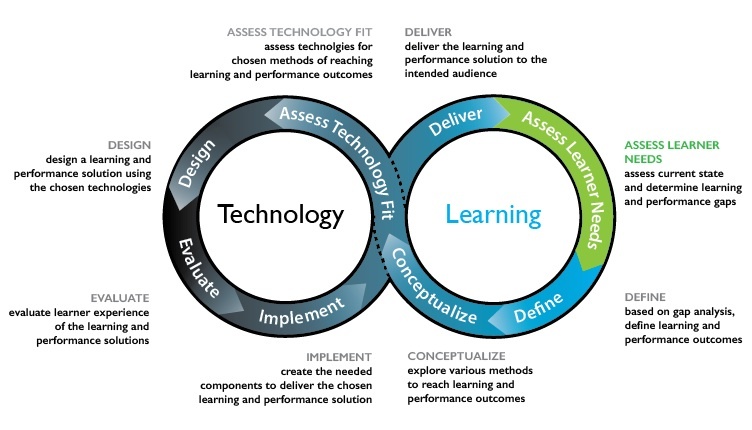 In particular, embedded within any decision about the use of technology in education and training will be assumptions about the learning process. We have already seen earlier in this book how different epistemological positions and theories of learning affect the design of teaching, and these influences will also determine a teacher’s or an instructor’s choice of appropriate media. Media selection is just one part of the course design process. It has to fit within the broader framework of course design. The SECTIONS model is strategy that could be used for assessing the technology fit within this course development process. Whether you are using ADDIE or an agile design approach, then, media selection will be influenced by the other factors in course design, adding more information to be considered. This will all be mixed in with your knowledge of the subject area and its requirements, your beliefs and values about teaching and learning, and a lot of emotion as well. All this further reinforces the inductive approach to decision making that I have suggested. Don’t underestimate the power of your brain – it’s far better than a computer for this kind of decision-making. But it’s important to have the necessary information, as far as possible. So if you skipped a part of this chapter, or the previous two chapters on media, you might want to go back over it! 1. Choose the same course that you chose for Activity 8.1. 2. Go to Appendix 2, and see how many of the questions you can answer. Use Chapter 8 to help, if necessary, including your answers to some the activities in Chapter 8. 3. When you have answered as many questions as you can from Appendix 2, what media or technologies will you now think of using. How does this differ from your original list? If there are changes, why? 1. Selecting media and technologies is a complex process, involving a very wide range of interacting variables. 2. There is currently no adequate theory or process for media selection. The SECTIONS model however provides a set of criteria or questions the result of which can help inform an instructor when making decisions about which media or technologies to use. 3. 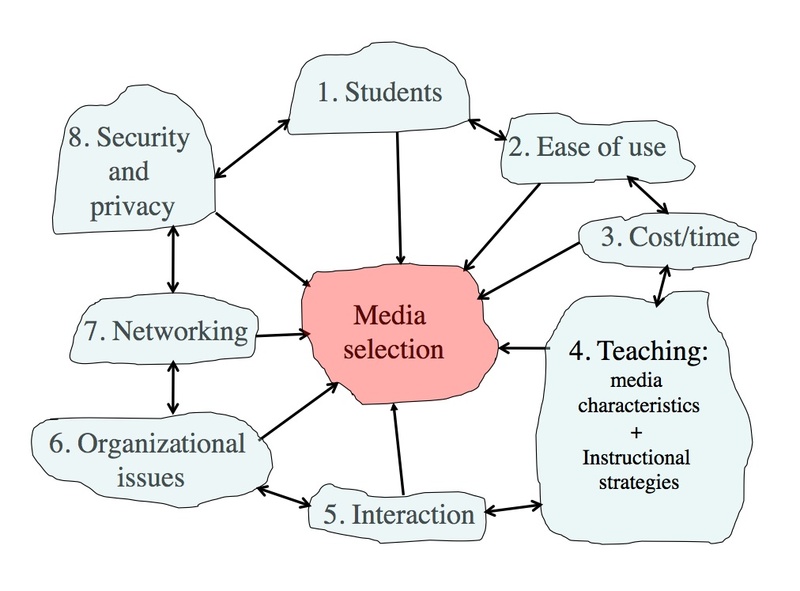 Because of the wide range of factors influencing media selection and use, an inductive or intuitive approach to decision-making, informed by a careful analysis of all the criteria in the SECTIONS framework, is one practical way to approach decision-making about media and technologies for teaching and learning. A recording of a webinar that focuses on the topics of Chapters 6, 7 and 8 can be accessed by clicking here. The recording includes discussion and participants’ comments. How do media differ pedagogically? How can new media and technologies be analyzed to assess their benefits and limitations for teaching and learning? Which criteria or questions can guide me in selecting among various media for my specific learning objectives and situations? The webinar was organised by Contact North|Contact Nord, Ontario, and took place on 3 November, 2015. 8.10 Deciding by Anthony William (Tony) Bates is licensed under a Creative Commons Attribution-NonCommercial 4.0 International License, except where otherwise noted.